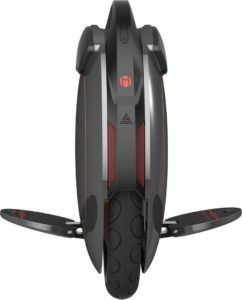 The InMotion V5F+ is a versatile, next-generation electric unicycle that has an intelligent design that exudes confidence and solid performance. This first-class design is not only meant to enhance the exterior aesthetics but packs rock-solid power that is essential for this kind of gadget. 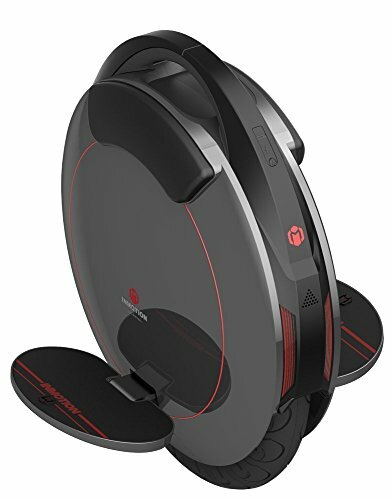 When you thought that both portable KKA and the GOTRAX GXL have a great sleek and compact design, wait till you grab a hold of this super one-wheel transporter. The V5F+ unicycle comes with a 550 W motor that is capable of speeds of up to 25 KM/hr. With a 480 Wh, fast-charging Lithium-ion battery, this vehicle cruises to a distance of 50 KM on a single charge while carrying a load of 120kg. It can carve at steep angles of up to 25 degrees while maintaining stability. This machine has regenerative breaking which makes riding downhill a breeze. With a lift-up button, the rider can disable the motor to prevent a spin that may result from the lifting of the wheel when trying to avoid an obstacle. The Inmotion V5F+ can deliver its payload to whichever destination regardless of terrain. Built with convenience in mind, it has an extendable handle for easy portability. Although it is lightweight at only 20kg, it packs enough power to deliver you to your destination. It is equipped with soft calf pads and attachable ankle pads to guarantee comfort for the rider. In addition, the pedals are designed to be high enough to dodge scratches during tricky maneuvers. The add-on grip tape helps to keep your feet tightly held to avoid slipping. Weighing a measly 20 kg, the V5F+ has a foldable handle that aids in transportation when the wheel is not in use. Though not as rigid and off-road type as the Razor AX200, you will find this scooter very easy to carry because of the lighter yet durable frame design. The kill switch underneath the carrying handle is a unique addition to this revolutionary unicycle. This allows the rider to pick up the wheel (for example when climbing stairs) without necessarily powering the unit down. Simply press the button to disable the drive. Other unicycles would beep every time they are lifted until you power them down. This tiny wheel that weighs 20kg can carry riders weighing up to 120 kg with perfect ease. It cruises up steep inclines with exceptional power. The V5F+ can comfortably cover 50 km on a single charge of the Lithium-ion battery. Larger commuters like the GLion Dolly may take you farther, but a whopping 50km for a scooter this size and weight is a no-brainer alternative! This electric unicycle has a 550 Watt engine that can achieve speeds of 15.5 miles per hour while carrying loads of 120kg. A powerful front LED Light ensures a well-lit path for your safety when it is dark. This also ensures that you are visible to others. Apart from the front light, the V5F+ is equipped with blue position LED strips, a rear red LED position light that doubles up as a brake light. All these provide maximum visibility of the rider by other road users. A strong 14″ rubber tire ensures that the V5F+ can haul up to 20kg. The 480 Wh Lithium-ion battery can power the unicycle for a distance of 50km on a single charge. It takes 2 hours to fully recharge. The stability of this unicycle is exceptional with a climbing angle of 25 degrees. The V5F+ connects to phones with the Android and iOS operating systems via Bluetooth. Using the InMotion App, you can monitor battery life and performance. With Bluetooth-supporting scooters such as the Xiaomi Mi Scooter surfacing over the years, it is easy to reason why this one had the great additional feature as well. You can additionally track your travels or share your experiences with friends and family via connected social networks. You can also perform wheel diagnostics on various components including the motor, battery, sensors, and lights or disable the sound system. The rear position light also acts as the brake light ensuring visibility from the rear. The installed speakers are used for playing wheel status sounds. The foldable handle makes the V5F+ easy to carry when not in use. The regenerative brake keeps the wheel stable even at sharp angles of up to 25 degrees. This is possible with loads of up to 120kg. The soft calf pads and attachable ankle pads guarantee comfort for the rider. The grip tape helps to keep your feet tightly held to avoid slipping. The water-proof surface enables the rider to mitigate tough riding conditions. The wheel is very solid with amazing engineering and is able to absorb considerable shock making every ride fairly comfortable. The cushion at the top of the wheel is made of leather making it very comfortable to the feet. The wheel also has some ankle padding that you can utilize to increase comfort. The InMotion App is available for Android and iOS, connecting to the V5F+ via BlueTooth. This enables you to monitor battery life and performance. You can also track your travels or share your experiences with friends and family via connected social networks. The V5F+ comes equipped with robust front lights that illuminate your path when it is dark. The LED position lights and battery indicators bring to life customizable light patterns that ensure that you are visible wherever you go. The rear position light doubles up as the brake light. The sound alerts are subtle and nonintrusive. These sounds will play when you turn on the wheel and when shutting down. As part of InMotion’s electric unicycle tradition, safe navigation and voice assistance remain an integral part of the system. If you exceed the tilt-back speed, the wheel will issue an alert saying “Danger, Danger” via the inbuilt speaker. There is a battery indicator located at front of the wheel. With the maximum speed of 25 KM/hr and the projected distance of 50 kilometers, the battery for this particular model lasts much longer and points to the power of Lithium-ion technology. The pedals on the Inmotion V5F+ are high enabling you to make extremely sharp and comfortable turns without losing stability. Looking at comparable unicycles in the market, this wheel exhibits the best in terms of pedal height, sharpness and stability. The grip tape on the pedals is designed to hold very well and projects the solidness required when navigating sharp bends. This prevents the rider from slipping off the wheel while in motion. The motor is manufactured to very high standards. Its power indicates a solid design that is strong and durable. Such strength is reassuring for one to engage in tilt back without worrying about stability. The cushion at the top of the wheel is made of leather, and this makes it very comfortable. The pedals do feel small compared to other unicycle wheels but this is compensated by the ankle padding that you can use to enhance comfort. To turn the wheel on or off, simply long hold the power button. To turn the headlight on or off, a single tap on the power button is enough. The Android application for the V5F+ can perform wheel diagnostics on various components including the motor, battery, sensors, and lights. By lifting the panel on the wheel, you are able to access the valve used for pumping air into the wheel. The unicycle’s high voltage ensures that the ride is smooth when accelerating and braking. The pedals are designed to be high enough on the 14″ wheel to dodge scratches during tricky maneuvers. The kill switch underneath the carrying handle allows the rider to pick up the wheel without necessarily powering the unit down minus the incessant beeping common with other unicycles. The V5F+ can carry riders up angles as sharp as 25 degrees. With the added advantage of regenerative braking, the wheel remains stable with loads of up to 120kg. For users who are new to unicycles, it may take a while to get the drift of such a powerful engine. The power of this wheel is perfect for the quintessential rider who loves the rush of adrenaline and the thrill of adventure with sharp turns and twists. The reason we like the V5F+ is largely based on the outstanding next-generation features that impressed us to the core. The unicycle’s high voltage ensures that the ride is smooth when accelerating and braking. This is unlike other electric unicycles. The footrests are positioned high with enough ground clearance to allow flexibility without sharp edges entangling your ankles. The kill switch underneath the carrying handle is a welcome addition that allows the rider to pick up the wheel without necessarily powering it down. This contrasts with other Electric unicycles that keep beeping when lifted, forcing the rider to switch them off. The Inmotion V5F+ ranks as the finest electric unicycle in the market today with next-generation features. With a design that is innovative and modern, its performance is exemplary with fantastic maneuverability and exceptional power.